Congressional candidate Lisa Brown (blue coat, left) talks with Derrek Baughn (in gray) and Stephanie Archer (in red) at Spokane Falls Community College. On Tuesday, when Cathy McMorris Rodgers was welcoming Vice President Mike Pence to Spokane, her opponent was courting college students. Lisa Brown visited Spokane Falls Community College Tuesday for a noon hour gathering, part of a series of college visits for the former chancellor of Washington State University Spokane. 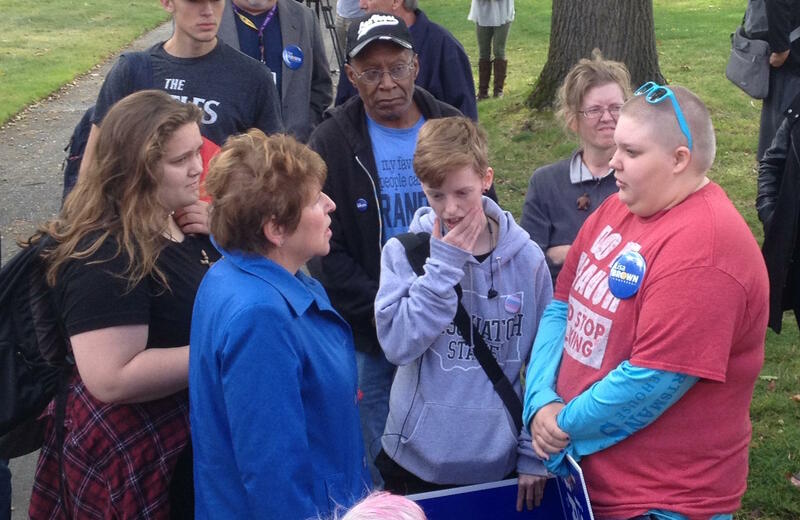 She stood on a makeshift stage and encouraged students who had gathered to listen and others who were wandering by to get involved with her campaign and to vote. Brown said she talked with another Hillyard woman who said she hadn’t voted in 20 years, yet feels an obligation to cast her ballot this year. “Our country needs us all to exercise our voice, our vote and to live up to the responsibility we have to help change our country for the better,” she said. This gathering was organized by the SFCC student government. 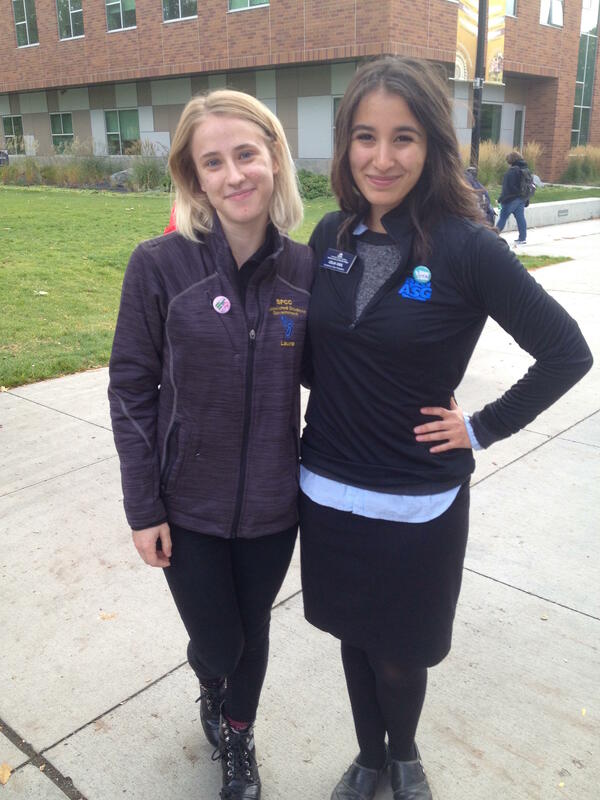 Laura Thomas and Celia Vigil helped SFCC students to register to vote at Tuesday's event. Vigil said, given the political energy in the country, she thinks more students will register and vote this year. Vigil and her colleagues set up tables where students could sign up, as did representatives of Brown’s campaign. Vigil said SFCC is participating in a statewide competition among colleges to see which institution can sign up the most students. Stephanie Archer waited patiently after Brown’s speech to meet the candidate. She was carrying a large Brown sign. Standing next to Archer, also with a Brown sign was Derrek Baughn. “I’m out here supporting the rights of transgenders. As a transgender myself, we’re fighting for full health care coverage. That’s been a struggle for us,” Baughn said. Others, including Celia Vigil, are concerned about access to and cost of higher education. “That’s one of our main concerns in life, how am I going to pay for the education that I need to ultimately become part of the work force?” Vigil said. She says SFCC has asked the McMorris Rodgers campaign if the congresswoman will also visit the campus. So far, no reply.